Food choppers make up one of the fastest growing segments in the small kitchen appliance business for lots of very good reasons. 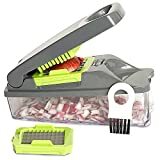 These handy, compact gadgets can perform a number of food prep tasks like chopping, mincing, and dicing - the kinds of jobs that can be time consuming and tedious if they have to be undertaken by hand - in just minutes. Food choppers also make a quick and easy alternative to setting up and then breaking down and cleaning a big food processor when the task at hand isn't big enough to merit that much work. As these are such popular gadgets, there are an ever growing number of food choppers on the market to choose from. Because you want to make sure that you choose the right one to suit your needs, we put together this shopping guide to help make that choice easier. Spring Loaded Manual Food Choppers: The most common type of food chopper, spring loaded manual choppers are spring loaded gadgets that are usually operated with a 'slapping' motion in which the user depresses ultra sharp blades to chop, mince, or slice small amounts of a chosen ingredient at a time. The food is placed on a chopping board and can then be chopped or minced as coarsely or finely as you like. 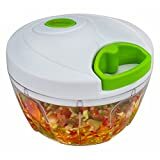 Manual food choppers are a great choice for chopping fruits and nuts, mincing garlic, or dicing and slicing vegetables into nice, uniform slices. Push Through Food Choppers: If a recipe calls for a carrot to be Julienned, or you want to make the kind of great waffle fries that you'll find at many restaurants, then a push through chopper is just the right gadget for the job. Although they come in different shapes and sizes push through choppers are all used in the same way: the food is pushed through a set of blades or sharp edged holes and comes out the other side all ready to go. Electric Food Choppers: Electric food choppers offer more in terms of their range of operations, as they can handle a larger quantity of food and can do things that manual food choppers cannot, such as purée. 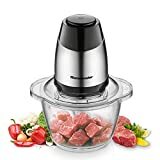 An electric food chopper is a great choice for those who like to make their own sauces, salsas and even jams, or who do not do enough home cooking to justify making a larger investment in a full sized food processor. Ease of Use: People prefer a food chopper that can just be taken out of the cupboard and used right away, with as little setup as possible. Manual food choppers rate highly in this respect, as using them is really as simple as placing the ingredients and then chopping away. Versatility: People love food choppers that offer them a wide range of options in terms of food prep. They enjoy the fact that a single 'slap chop' model allows them to cut larger chunks of vegetables for soups and stews, finely chop nuts for use in baking breads and cakes, and mince garlic for use in an entrée - all with the same piece of equipment! Great for Gourmets: Push through choppers offer more adventurous chefs the chance to get more creative with their cooking. A waffle fry is a staple on the appetizer menus at upscale restaurants, as are vegetables that have been Julienned and even shaped. For these uses, push through food choppers were rated best, as they can produce the precision cuts needed for these dishes to be a success. Ease of Cleanup: Maybe the biggest advantage that people feel their food choppers offer them is just how easy they are to clean up after use. The highest rated food choppers here are those that can be easily disassembled and then popped right into the dishwasher. Buying a food chopper that has stainless steel blades offers a number of advantages in terms of durability and maintaining a sanitary environment while you are preparing food. Stainless steel blades are smoother than other blades and essentially poreless, which means that they are much easier to clean and keep sharp. 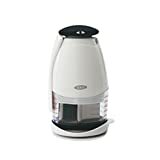 Because it is a smaller item, many people prefer to opt for a food chopper that can be kept on the kitchen counter at all times. This does mean that style and color will become factors in your choice, but the good news is that there are plenty of great looking options to choose from. 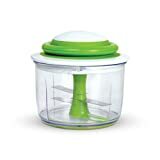 Making use of an electric food chopper can be a great way for moms to quickly and easily prepare their own baby food. Such food choppers purée fruits and vegetables to a nice smooth consistency and allow you to make smaller quantities so that food you offer to your child is as fresh and healthy as possible. To avoid accidental injury, make sure that your food chopper is properly assembled every time you come to use it, especially if it has parts that are controlled electronically rather than by hand. When cleaning any food chopper, disassemble the unit with care and consider wearing rubber gloves when you do to avoid accidental nicks and cuts. Black and Decker: Established in 1917 in Baltimore, Black and Decker are one of the world's leading providers of both power tools and small home appliances. Their electric food choppers come in a range of sizes and shapes to suit any style, need, or budget. Pampered Chef: Pampered Chef specialize in offering restaurant quality kitchen equipment for use by amateur chefs and home cooks everywhere. Their manual food chopper is their most popular kitchen tool, and even has a flexible cap that doubles as a chopping board. Hamilton Beach: This Wisconsin-based company has been a leader in the small kitchen appliance industry since the 1950s and is well known for its affordable offerings. Their electronic food choppers feature stainless steel blades, dishwasher safe components, and a hideaway cord to aid in unobtrusive and space-saving storage.